With a new season, kids and parents often have high hopes for what will happen. Sometimes, that translates to high expectations. Believe it or not, you can get the new season off to a bad start with such expectations. It’s pretty natural for parents to have high expectations about their kids’ success. But it’s also important to keep in mind what’s best for your child’s confidence. For example, Lisa has a 5-year-old who will be playing soccer for the first time. Because he’s small, she’s tempted to run him through some drills before his first practice Saturday. She’s tempted to give him every secret on earth about how shorter kids can run faster. But she knows such behavior will only pressure him and may ruin his whole experience—before it has even begun! Parents, as the new season gets underway, keep your expectations in check. When kids feel pressured by your expectations, they don’t enjoy sports as much. They pressure themselves, which often leads to them feeling tense and worried. You want your kids to have fun, feel relaxed, take risks and grow! Also, try to understand why your child wants to play sports. Lisa’s son, for example, wants to stay in touch with friends who won’t be attending kindergarten with him. It’s purely social. If your child’s goals are purely social, be sure to support his goals—not yours! Be sure to keep an eye out for such confidence busters. If you and your sports kids can identify them, you’ve gone a long way toward solving them! For example, kids who tell themselves “I’m to small to run fast,” tend to tell themselves “I can’t” statements. You need to change the way these kids think and help them embrace more positive thinking! 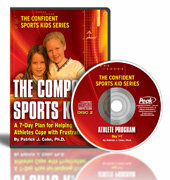 If you’d like to learn more about common confidence busters and how to overcome them as the season begin, be sure to check out our “Confidence Sports Kid” CD and workbook program. In just seven days, you and your kids will learn all you need to know to get the season off to the right start! What do folks say about our resources? “I watched your neat online mental game videos and loved them! There was so much that I could relate to, both with my son and myself. Help your sports kids make the most of their experience! Lisa Cohn and Patrick Cohn, Ph.D.